The new law will bring the state into conformity with federal standards by requiring the removal of a quarter of signs directing drivers to secondary destinations. AUGUSTA — Gov. Paul LePage has signed a bill that will remove or alter a quarter of signs on Maine highways directing motorists toward secondary destinations. The bill, which stemmed from a plan from the Maine Turnpike Authority and the Maine Department of Transportation to bring Maine into compliance with federal highway standards, will be implemented over the next five years. Businesses and towns opposed the bill at a well-attended public hearing at the State House earlier this month, with many of them saying the bill would hurt tourism, making it harder for visitors to find rural attractions. The bill would affect 56 of Maine’s 225 supplemental guide signs on Interstates 95, 295 and 395, a 5-mile road from Bangor to Brewer. The signs point drivers to exit numbers for municipalities, regions, businesses, schools and other attractions not immediately off of interchanges. Of those signs, 22 will be removed, mostly because they’re either too small, redundant, too far away or don’t draw necessary numbers of visitors. The Belgrade, Winthrop and China lakes regions have signs in this category. Another 19 will be removed, but their beneficiaries can pay for access to logo signs, similar to the ones used by hotels and fast-food restaurants. Civic centers in Augusta and Portland will lose existing signs under this rule, as will Scarborough Downs, a harness racing track. The rest of the signs, 15 in all, will be removed but qualify for another sign at a different spot on Maine’s highway system. For example, a sign for the University of Maine at Machias on the turnpike in Hallowell will be moved north to a spot closer to the Washington County school. The turnpike authority and the transportation department have said Maine’s federal highway funding would be jeopardized by not following federal standards, which use population, distance and other guidelines to decide whether signs are warranted. Courtney said the turnpike will start taking down signs from 2015 to 2017, while Ted Talbot, a spokesman for the transportation department, said it probably will finish taking signs down in five years. The measure passed easily in the Maine House of Representatives, but found opposition last week in the Senate, when all but three Republicans voted against it, along with three Democrats. It passed by just five votes. By then, the bill had been amended to protect 12 other signs that the turnpike authority originally wanted to take down. Legislators saved signs for ski areas, including Black Mountain Ski Resort in Rumford and Lost Valley in Auburn. Also, signs for cities and towns that were too small to have signs under the initial criteria were saved if the city or town has a portion of the interstate system passing through it. 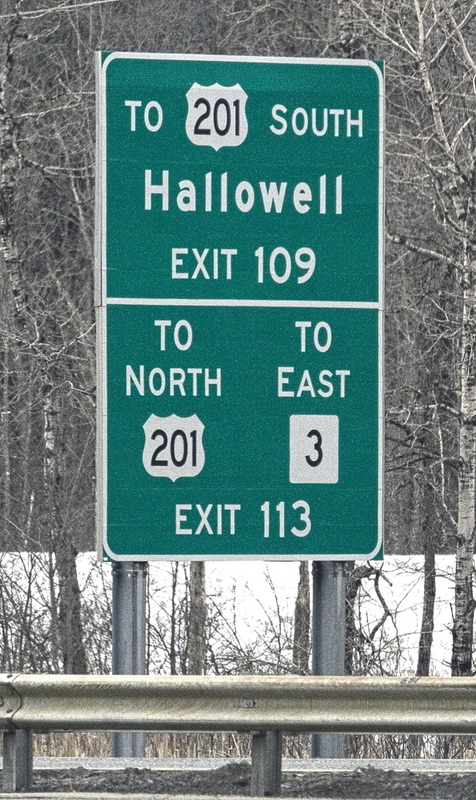 Hallowell’s sign on the turnpike was protected that way. Curtis Lunt, town manager in Monmouth, testified against the bill. But the town’s sign on Interstate 95 was set for removal after LePage signed the bill, as it’s too small a town to qualify. But on Thursday, Lunt was unperturbed, saying many people already get around using GPS devices, and even more will in five years. They’ll find their way to Monmouth, he said.